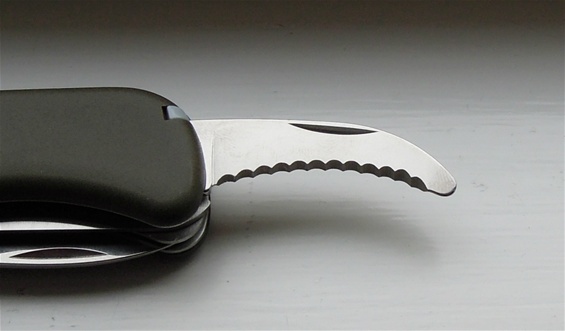 Some years ago i had a question in at Victorinox about the 111mm slide-lock category of knives. It is interesting that this line of knives was introduced in the mid-1980s. 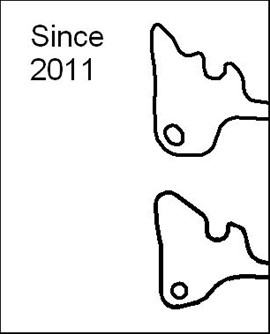 The reason for this was the questions from people that had the need for a larger Swiss Army Knife with a locking blade. This line of knives is a success. It is so with this locking blade and mechanism that it is only to prevent accidental closing. 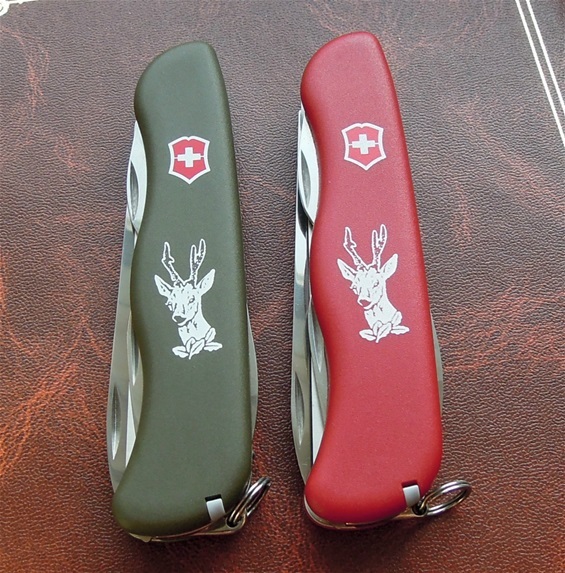 Victorinox got a constant quality development and how the knife can be improved. Over the years I have had in my hand many knives from this category and some of them have been hard used knives. Many times the complete knife is full of dirt and substances that prevent the functionality. After a good cleaning and some oil the tool is fully operational again. When it comes to the locking mechanism I have not yet seen it fail. 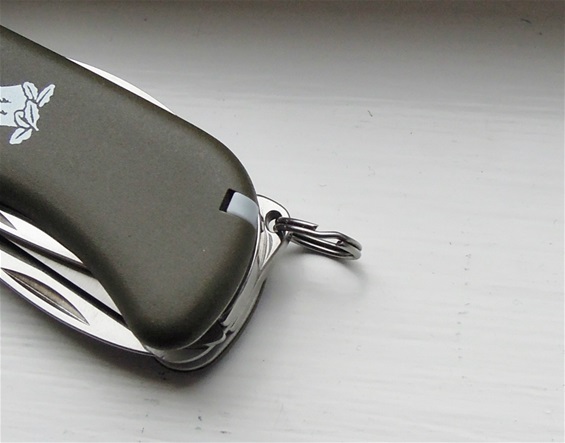 In my questions to Victorinox I got the information that the locking mechanism and spring was going to be improved. I have wanted to show you this for some time. On the pictures you can see two Hunter knives in this category. This knife is a very popular tool for the outdoors and for hunters. This knife comes in olive or red regardless of modifications. Atleast it seems so. The slide-lock locks the spring and therefor it is an extra interesting mechanism. Some changes in the production of SAKs are done for the production itself and some are done to improve the functionality with quality. As I see it this modification improves the locking mechanism and spring. The most obvious reason is the closed spring that will prevent dirt and therefor improve the quality. If it is stronger i do not know, it may be stronger. The philosophy of the lock is the same from my information. 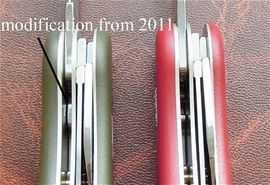 The new changes from 2011 can now be seen on the knives and it is very easy to distinguish by just looking inside on the spring. You cannot see the slider anymore! The affixture for the key ring is also changed and it is easy to see. The constant production and quality development by Victorinox gives an evolution that i really enjoy. There are more changes with the tang stamps and other details as well. Here you can see it on the knives! 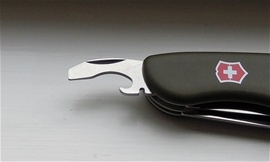 I have used a Rucksack model in this category with the before 2011 mechanism and it is a very good knife. I have no complaints! The combination tool used on the 111mm line of knives is solid and useful. 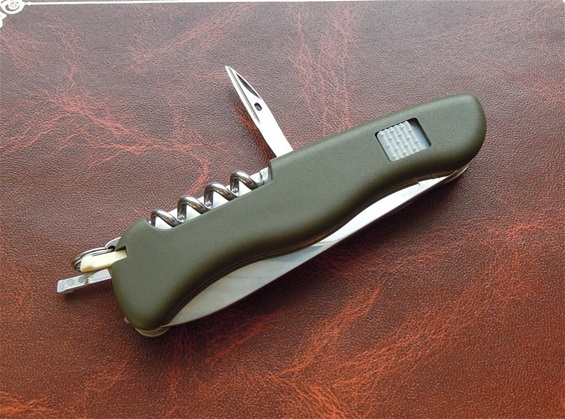 It is a small flat screwdriver, can-opener, cap opener + it got the stripping and bending tool. The curved blade with wavy edge is a multifunction tool that can be used for much more than gutting an animal. It can be used for rope, safety and many other tasks. It is very interesting the new changes for the 111mm slide-lock models. The reason for this is the completely new spring. This spring is also a slip-joint construction. This and the locking mechanism are then a bit changed like I have mentioned above in the sense of improving it. The corkscrew is also depended on this spring. The affixture for the key ring is a part of the same spring that are changed and improved. This is an important part of the construction on the 111mm knives. The key ring is important for the safety and functionality for lanyard purposes and more. The new opening may be better because it may be more solid and it gives the possibility to use a stronger ring and therefor safer. It is also possible to use paracord with some thickness without the ring. For sure the ring itself can move more free with the new changes. The full number on the green Hunter is 0.8873.4. This knife is going in my collection and therefor I will not test it. The modifications are interesting and there is another small difference and this is the small or slightly lighter spring pressure when opening the blade. The blade is manually opened and guided by the slip-joint spring. The blade is locked when fully out. The weight of the complete tool is around 100 grams and the new modified SAK is actually one gram more heavily than my old. The mechanism is a slip-joint mechanism if we do not take into consideration the locking of the spring in the out position. The blade is held in place in the out position by the spring regardless of the lock. It is held in in position by the same spring. The locking of the spring is very interesting and it is a different mechanism than one would find from other Brands. It serves the function of locking the blade for preventing accidental closing. A longer blade on this type is we should call it slip-joint would need a lock; if not the spring pressure must be much stronger for a certain safe functionality. On a pure slip-joint mechanism the use of longer blades would be different. The changes on the 111mm slide-lock category are just modifications but improved as I see it so far and interesting. It would be fun to see the mechanical drawings of the lock itself to see. I can add that I can see part of the slider moving but just barely between. I suspect another detail with the new spring for the slider and this is that it is not only preventing dirt and substances. I suspect the slider is locked in a way that it would not be possible for it to collapse outside the spring. 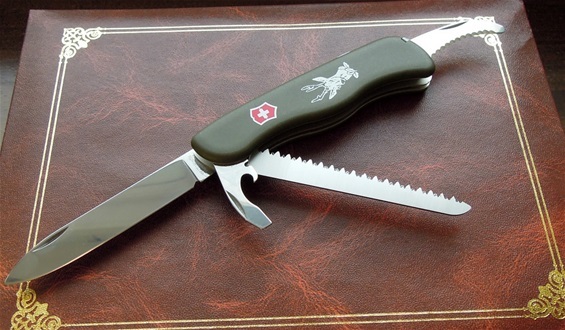 The new changes or modifications are as i see it becasue of the Victorinox constant quality improving!